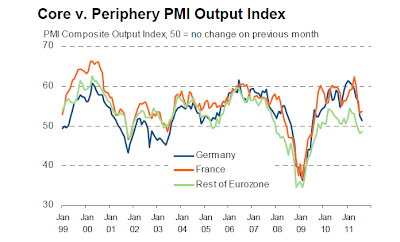 The Eurozone story is one of read the details carefully. The composite index was unchanged at 51.1, which means a very sligh expansion in activity (50 is the neutral point), so the sharp deterioration seen in recent months did grind to a halt. But to understand the “why” of this we need to drill down into some of the individual country aspects. 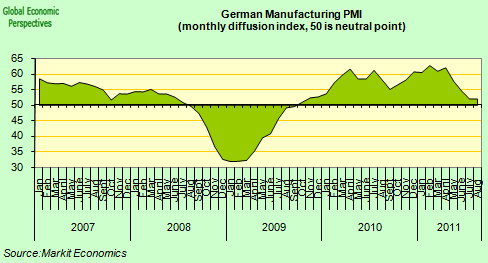 But then again, drilling down within the German manufacturing data we find even more interesting details. 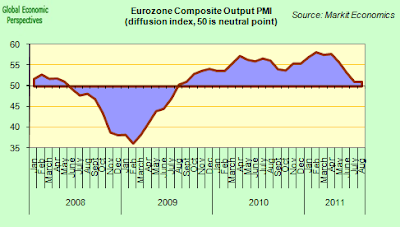 In the first place the current output reading was up (from 51.8 to 53.1 – it is important to remember that the PMI is a composite of several different components of which current output is only one). At the same time, survey participants reported weaker growth of overall business activity which they primarily attributed to lower intakes of new work in August. 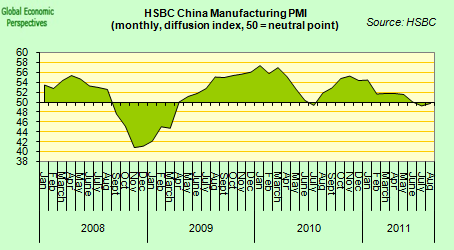 As the PMI report notes, “although the decline in new business volumes was relatively modest, it represented a change of direction after a two-year period of continuous expansion. Both the manufacturing and service sectors registered falling levels of incoming new work”. In particular the fact that manufacturers suggested that weaker export sales had contributed to the reduction in new orders in August is more than worthy of note. 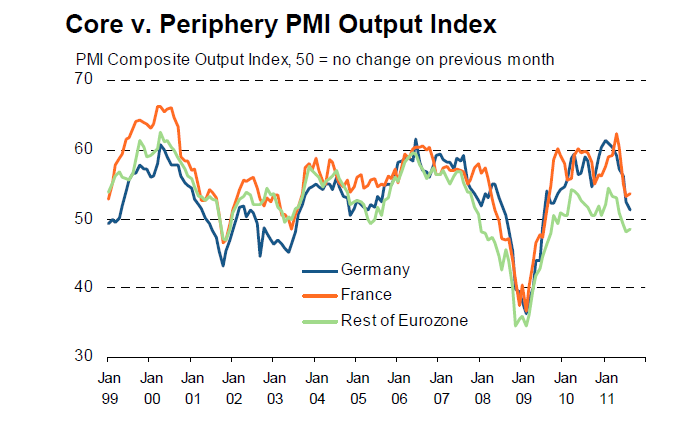 In fact, the latest data pointed to the fastest drop in new work from abroad since June 2009. So the indicator remained stationary due to the combined impact of heavier current output and deteriorating export orders. What we call in Spain “pan para hoy, y hambre para maÃ±ana (bread today at the price of hunger tomorrow). 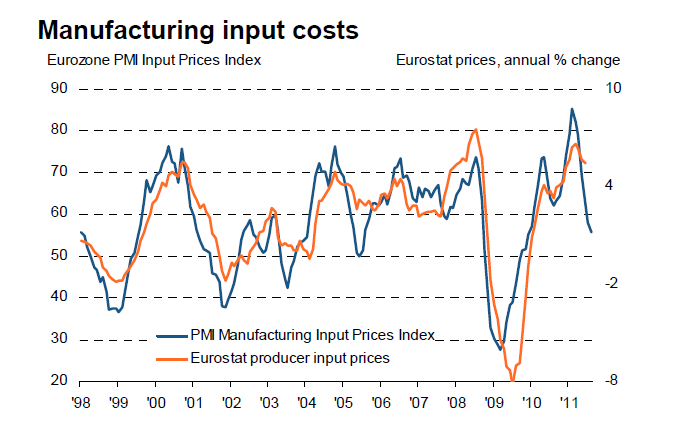 Basically the rise in manufacturing output this month seems to have been largely the result of inventory increases. 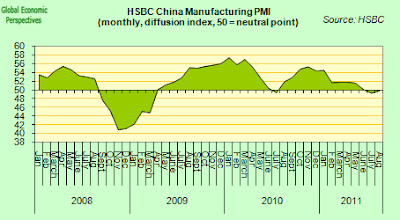 According to the PMI report, “the forward-looking new orders to stocks of finished goods ratio in the manufacturing sector deteriorated again during the latest survey period. 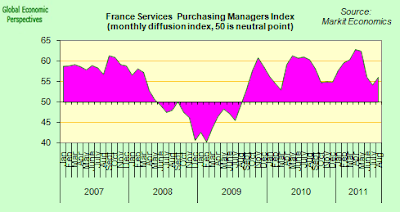 It was at its lowest level since April 2009, following a survey-record accumulation of post-production inventories in August”. 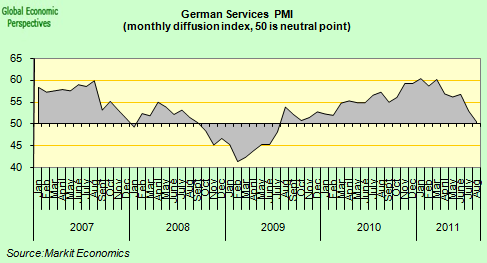 This general picture is confirmed by other recent German surveys. 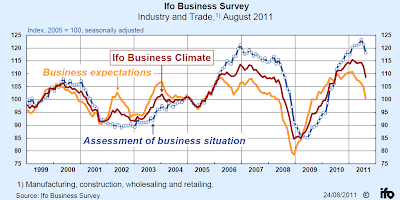 The IFO index – and most notably the businesses expectations part – fell back again in August. indeed, German business morale posted its steepest drop during the month that at any time since the aftermath of the Lehman Brothers collapse in late 2008. The Munich-based Ifo think tank said its business climate index, which is based on a monthly survey of some 7,000 firms, fell to 108.7 in August from 112.9 in July, well below the Reuters consensus forecast for a 111.0 reading. The last time the index fell so sharply was in November 2008, just after the collapse of Lehman Brothers when the German economy was in its deepest post-war recession. This month’s was the lowest reading for the index since June of last year. Even more importantly there was a sharp decline in the Ifo’s expectations subindex which fell to 100.1, its lowest in almost two years, and down from 105.0 in July. 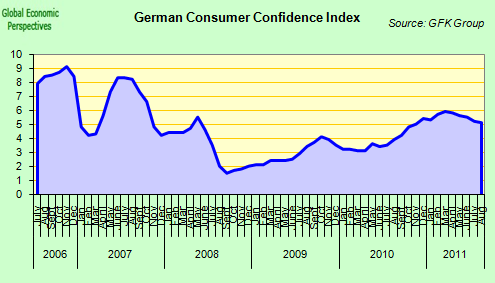 This drop in German consumer confidence forms part of a much wider European pattern, since Eurozone consumer optimism also plummeted in August at the fastest rate for 20 years The European Commission said its consumer confidence indicator fell 5.4 points to minus 16.6 in August â€“ a larger monthly fall than was seen in October 2008 after the collapse of Lehman Brothers. On the inflation front, price pressures eased again markedly during the month. Average prices charged for goods and services showed only a modest increase, the rate of inflation moderating further from Aprilâ€™s high to reach a nine-month low. Service sector charges showed a particularly weak rise, the smallest monthly gain since services charges began rising in February. 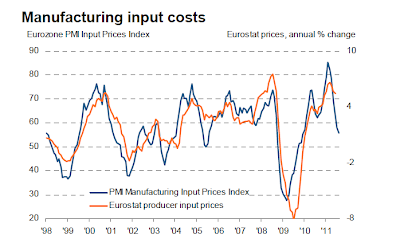 But, according to the report, it is in manufacturing where the steepest turnaround in price pressures has been evident. Prices charged for goods showed the smallest monthly increase for a year in August, in marked contrast to the survey-record high seen back in March. Respondents suggested that the slower rate of increase of selling prices reflected a combination of sluggish demand and a further substantial easing in input price inflation. Service sector input costs rose at the slowest pace for ten months, while manufacturersâ€™ input price inflation eased to a 20-month low, taking the overall rate of increase across both sectors down to the weakest since February of last year.